The history of long songs begins probably in the late Sixties with Procol Harum who levelled the field in 1968 with their album Shine On Brightly, where most of the B-side was taken up by the nearly twenty minute song In Held 'Twas In I. Ever since then it was the prerogative of all kinds of progressive rock bands to craft side-long epics, culminating with Jethro Tull’s Thick As A Brick (1972), which needed both sides of the vinyl record, and also with Yes’ Tales From Topographic Oceans (1973), a double album with four side-long suites. Heavy metal joined that game pretty late, and until today it is still rare to find these wonderfully self-indulgent bands. The most popular example is certainly Edge Of Sanity’s Crimson (1996), and there are also a couple of progressive rock/metal bands, like Dream Theater, Spock’s Beard, Transatlantic, who also did similar stuff. 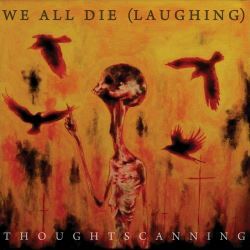 But with We All Die (Laughing), we are in the presence of a talented duo of experienced musicians who continue where Edge Of Sanity left off, adding even more craziness to the mammoth track Thoughtscan of their similarly titled debut album Thoughtscanning. The two involved masterminds are vocalist Arno Strobl, a man in his forties who used to sing for avantgarde metal band Carnival In Coal, and multi-instrumentalist Déhà from such different bands like Maladie, COAG and many more. Thoughtscan is clocking in at thirty-three minutes, and where lesser artists would sooner or later have lost their thread, We All Die (Laughing) made sure to thoroughly compose their song from beginning to end. Both artists are dedicated at what they are doing and true geniuses at their craft, with Strobl having an incredibly varied voice, and Déhà mastering every single style that can be found in the vast metal universe. It wouldn’t make sense dissecting the song. That task should be up to the listener, allowing them to discover the finesses to be found on Thoughtscan. Suffice it to say that this is a mesmerising voyage from dark metal over thrash metal into black metal territories, with lots of virtuoso instrumental parts and some unexpected moments, like for instance the jazzy clarinet intermezzo in the middle of the track. This couldn’t be further away from the formulistic prog rock endeavours of Dream Theater and Transatlantic. In fact the so-called progressive note isn’t that strong. Instead there is more of an avant-garde touch permeating the entire piece, making the listening experience ever so much more adventurous. And still this is not really an entirely heady mix. You can also enjoy it without digging too deep, but doing that effort leaves you of course with a much more redeeming value. The limited CD digipak edition comes with an additional track where We All Die (Laughing) try their hand at the Amy Winehouse’s classic track Back To Black, which is not available on the download version. I dare say that even fans of the late soul lady will not be offended, as this has nothing of a parody, but is a worthy tribute reflecting the darkness and despair of the original version. While Thoughtscanning is possibly not reinventing the metal genre as such, it is still an incredibly fun listen that manages to combine the most different genres of music into a cohesive entity that should find hordes of fans. Let’s hope that We All Die (Laughing) will not just be a one-off session by this Franco-Belgian duo.